"The Prince and the Poacher"
In the 1950s, Robin Hood was Richard Greene, star of The Adventures of Robin Hood. This fondly-remembered series ran from 1955-58 on CBS in the US and 1955-60 on ITV, Britain's new commercial channel. Several comic book publishers sought to cash in on a public domain action hero like Robin Hood. In the 1950s, comic books were anthologies. Each issue of this series contained a few Robin Hood stories, one of "Sir Gallant of the Round Table" and an educational text piece "In the Days of Knights". 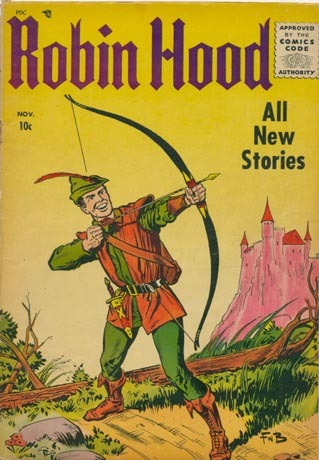 The Magazine Enterprises (ME) version of Robin Hood ran eight issues. Issues 6 through 8 were re-titled "The Adventures of Robin Hood" and sported photo covers of Richard Greene. Hang on -- eight issues? Then why is this story from issue 52? Well, actually the series took over the numbering from a previous series. It was a good way to dupe the post office and not apply for new mailing privileges. The numbering is 52, 53, 3 - 8. And it's not the only comic to have such bizarre numbering. Charlton's Robin Hood and his Merry Men series began at issue 28. This origin story features Robin Hood returning from the Third Crusade. The Robin Hood in the Richard Greene series was also a returning crusader, except on TV, he was not the earl of Huntingdon -- merely Robin of Locksley. The 1950s comics of Quality Comics and DC Comics also made Robin the earl. In the ME comic series, the Sheriff of Nottingham's name was Robert Murdach. The real-life sheriff of Nottinghamshire in the 1180s was Ralph Murdac, and later he was the castellan of Nottingham Castle when King Richard returned to lay siege to the town. Henry Gilbert's novel also used Ralph Murdach's name for the sheriff. In the 7th issue, Robert Murdach is fired and replaced with his cousin, also named Sir Robert Murdach. The new Murdach was drawn to resemble Alan Wheatley, who played the part on the television show. (Little John was also remodelled to resemble actor Archie Duncan.) In the ME comics, Robin fights Gui of Glamore not Guy of Gisborne. This story features a special guest star. This historical and legendary character's story has occasionally been woven into the Robin Hood legend. On television, Greene's Robin rescued him in "The Prisoner" episode. You might also note Robin's costume is predominantly orange. The primary colour of most comic book Robin Hoods of the time was red, orange or yellow -- even though the text usually referred to him as the "man in green". The Magazine Enterprises version of Robin Hood was not the best comic book Robin Hood [DC's] or the worst [definitely Charlton's]. But I hope you'll still find this story entertaining. The comic book is reproduced without permission. But as Magazine Enterprises went out of business in the 1950s, I believe the comic book story has fallen out of copyright. If I am mistaken, please contact me.